Rachael began playing at the age of 8 having lessons with Shaun Thomas in the Mount Charles Junior Band. She later progressed into the Mount Charles Youth Band. She joined the St Dennis Band in 2008. Rachael was the Principal Baritone player with the Cornwall Youth Brass Band for many years. Rachael has passed many grade examinations, achieving her grade 8 in the Summer of 2009. Kim began playing at the age of seven after receiving a letter at school offering tuition through St Dennis Band, much to the delight of her father Peter (also in the band) whom had only recently decided to take a break from banding! Kim has loved being a member of the organisation for over 20 years and has many fond memories of various engagements, contests and social events. Highlights include winning three National Titles, winning the ‘Best Euphonium Player of the Day’ on 4 occasions at the West of England Bandsmen’s Festival, and numerous contesting successes with the brilliant Youth band she was fortunate to be part of. Kim also played Solo Euphonium with the Cornwall Youth Brass Band for a number of years, allowing her to play under a number of tremendous conductors, including Roy Newsome, Bob Childs and Philip Harper to name a few, proudly winning the Cornwall Youth Band Player’s Player award on one occasion. As well as being a player Kim enjoys organising ‘Party in the Park’, an event held each year to raise much needed funds for the organisation. 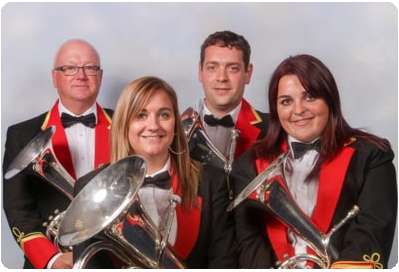 Over the years many individuals have made an impression and influenced Kim’s banding career, most notably Nigel ‘Frizzy’ Grose, whom she spent many years sitting alongside in the band and her dad Peter, both of whom taught her how important it is to enjoy banding and the experiences it allows you as well as demonstrating how to be a true ‘bandsman’ (woman!). Neil first started learning with the Mount Charles Youth Band in 1992, quickly progressing to solo euphonium in the youth band from 1994 to 2003. In 1997 Neil joined the Mount Charles Senior band on 2nd Euphonium and was lucky to learn from two amazing players – Rob Jose and Shaun Thomas and had lessons from the bands resident conductor Bryan Hurdley. In 2005 he moved on to Solo Euphonium until having a break from playing in 2009. Neil was asked if he would help out the St Dennis Band for one contest in November 2011 and has been there ever since! Highlights of Neils playing were winning the best instrumentalist prizes at Blackpool music for youth festival, Torquay youth section and at Bugle Contest, also playing in the Albert Hall four times.